除非另外说明，否则所有的“马克白”引述为Muir (1984)，莎士比亚其它作品则引述为Wells and Taylor (2005). ^ Muir, Kenneth, ed. (1984)  Macbeth. The Arden Shakespeare, Second Series, 11th ed., p. xxxvi. ^ 12.0 12.1 Nagarajan, S. A Note on Banquo. Shakespeare Quarterly. 1956, 7 (4): 371–376. JSTOR 2866356. ^ Palmer, J. Foster. The Celt in Power: Tudor and Cromwell. Transactions of the Royal Historical Society. 1886, 3: 343–370. doi:10.2307/3677851. ^ Maskell, D. W. The Transformation of History into Epic: The 'Stuartide' (1611) of Jean de Schelandre. The Modern Language Review. 1971, 66 (1): 53–65. JSTOR 3722467. ^ Braunmuller. Macbeth (PDF). Cambridge: Cambridge University Press. 1997: 2–3. ISBN 0-521-29455-X. ^ Paul, Henry Neill. The Royal Play of Macbeth: When, Why, and How It Was Written by Shakespeare. New York: Macmillan. 1950: 227. ^ Kermode, Frank. Macbeth. The Riverside Shakespeare. Boston: Houghton Mifflin. 1974: 1308. ISBN 0-395-04402-2. For details on Garnet, see Zagorin, Perez. The Historical Significance of Lying and Dissimulation—Truth-Telling, Lying, and Self-Deception. Social Research. 1996, 63 (3): 863–912. ^ Braunmuller (1997) pp. 5–8. ^ Rogers, H. L. "An English Tailor and Father Garnet's Straw". Review of English Studies 16: 61 (February 1965), 44-9; pp. 44-5. ^ Rogers (1965) pp. 45-7. ^ 32.0 32.1 Kermode, Riverside Shakespeare, p. 1308. ^ Perkins, William. A Discourse of the Damned Art of Witchcraft, So Farre forth as it is revealed in the Scriptures, and manifest by true experience. London: Cantrell Legge, Printer to the Universitie of Cambridge. 1618: 53 [24 June 2009]. ^ Coddon, Karin S. 'Unreal Mockery': Unreason and the Problem of Spectacle in Macbeth. ELH. 1989, 56 (3): 485–501. JSTOR 2873194. ^ 55.0 55.1 Frye, Roland Mushat. Launching the Tragedy of Macbeth: Temptation, Deliberation, and Consent in Act I. The Huntington Library Quarterly. 1987, 50 (3): 249–261. ^ 56.0 56.1 Robert Faires, "The curse of the play", Austin Chronicle, 13 October 2000. ^ Tritsch, Dina. The Curse of 'Macbeth'. Is there an evil spell on this ill-starred play?. pretallez.com. April 1984 [28 November 2010]. （原始内容存档于2011年7月15日）. ^ Dunning, Brian. Toil and Trouble: The Curse of Macbeth. skeptoid.com. 7 September 2010 [28 November 2010]. ^ Babylon 5 – The Scripts of J. Michael Straczynski, Volume 6 by J. Michael Straczynski, Synthetic Labs Publishing (2006). ^ Garber, Marjorie B. Profiling Shakespeare. Routledge. 2008: 77. ISBN 978-0-415-96446-3. Adams, Joseph Quincy. Shakespearean Playhouses. Houghton Mifflin. 1917. Bald, Robert Cecil. Macbeth and the "Short" Plays. Review of English Studies (Oxford University Press). 1928, 4: 429–31. Barnet, Sylvan. Macbeth on Stage and Screen. (编) Barnet, Sylvan. Macbeth. Signet Classics. New American Library. 1998: 186–200. ISBN 978-0451524447. Bentley, Gerald Eades. The Jacobean and Caroline Stage 6. Clarendon Press. 1941. Bloom, Harold. Shakespeare: The Invention of the Human. 1999. ISBN 1-57322-751-X. Braunmuller, Albert R. Introduction. (编) Braunmuller, Albert R. Macbeth. Cambridge University Press. 1997: 1–93 [16 August 2012]. ISBN 0-521-22340-7. Brode, Douglas. Shakespeare at the Movies: From the Silent Era to Today. Berkley Boulevard. 2001. Brooke, Nicholas (ed.) and Shakespeare, William. The Oxford Shakespeare: Macbeth. Oxford University Press. 2008. ISBN 978-0-19-953583-5. Brown, John Russell (ed.). The Oxford Illustrated History of the Theatre. Oxford University Press. 1995. ISBN 0-19-285442-9. Brown, Langdon. Shakespeare around the Globe: A Guide to Notable Postwar Revivals. Greenwood Press. 1986. Bryant, Jr., J. A. Hippolyta’s View: Some Christian Aspects of Shakespeare’s Plays. University of Kentucky Press. 1961 [1 November 2009]. Burnett, Mark Thornton and Wray, Ramona (eds.). Screening Shakespeare in the Twenty-First Century. Edinburgh University Press. 2006. ISBN 0 7486 2351 5. Chambers, E. K. The Elizabethan Stage 2. Clarendon Press. 1923. ISBN 0-19-811511-3. OCLC 336379. Coddon, Karin S. 'Unreal Mockery': Unreason and the Problem of Spectacle in Macbeth. ELH (Johns Hopkins University). 1989, 56 (3): 485–501. doi:10.2307/2873194. Coursen, Herbert R. Macbeth: A Guide to the Play. Greenwood Press. 1997 [15 August 2012]. ISBN 0-313-30047-X. Dunning, Brian. Toil and Trouble: The Curse of Macbeth. Skeptoid: Critical analysis of Pop Phenomena. Skeptoid.com. [28 November 2010]. Faires, Robert. The curse of the play. The Austin Chronicle. 13 October 2000 [19 August 2012]. Garber, Marjorie B. Profiling Shakespeare. Routledge. 2008. ISBN 978-0-415-96446-3. Greenhalgh, Susanne Shakespeare Overheard: Performances, Adaptations and Citations on Radio in Shaughnessy (2007, 175-198). Guntner, J. Lawrence Hamlet, Macbeth and King Lear on Film in Jackson (2000, 117-134), especially the section Macbeth: of Kings, Castles and Witches at 123-128. Halliday, F. E. A Shakespeare Companion 1564-1965. Penguin. 1964. Hodgdon, Barbara and Worthen, W. B. (eds.). A Companion to Shakespeare and Performance. Blackwell Publishing Limited. 2005. ISBN 978-1-4051-8821-0. Jackson, Russell (ed.). The Cambridge Companion to Shakespeare on Film. Cambridge University Press. 2000. ISBN 0 521 63975 1. Jess-Cooke, Carolyn Screening the McShakespeare in Post-Millennial Shakespeare Cinema in Burnett and Wray (2006, 163-184). Kermode, Frank. 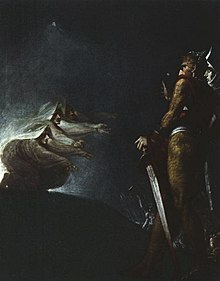 Macbeth. (编) Evans, C. Blakemore. The Riverside Shakespeare. Houghton Mifflin. 1974: 1307–11. ISBN 0-395-04402-2. Kliman, Bernice; Santos, Rick. Latin American Shakespeares. Fairleigh Dickinson University Press. 2005. ISBN 0-8386-4064-8. Lanier, Douglas. Shakespeare and Modern Popular Culture. Oxford Shakespeare Topics. Oxford University Press. 2002. ISBN 0-19-818703-3. Marsden, Jean I. Improving Shakespeare: from the Restoration to Garrick in Wells and Stanton (2002, 21-36). Maskell, David W. The Transformation of History into Epic: The 'Stuartide' (1611) of Jean de Schelandre. Modern Language Review (Modern Humanities Research Association). 1971, 66: 53–65. doi:10.2307/3722467. Mason, Pamela Orson Welles and Filmed Shakespeare in Jackson (2000, 183-198), especially the section Macbeth (1948) at 184-189. McKernan, Luke and Terris, Olwen. Walking Shadows: Shakespeare in the National Film and Television Archive. British Film Institute. 1994. ISBN 0-85170-486-7. Moody, Jane Romantic Shakespeare in Wells and Stanton (2002, 37-57). Muir, Kenneth. Introduction. (编) Muir, Kenneth. Macbeth 11. The Arden Shakespeare, Second Series. 1984: xiii–lxv . ISBN 978-1-90-343648-6. Nagarajan, S. A Note on Banquo. Shakespeare Quarterly (Folger Shakespeare Library). 1956, 7 (4): 371–6. Orgel, Stephen. The Authentic Shakespeare. Routledge. 2002. ISBN 0-415-91213-X. Palmer, J. Foster. The Celt in Power: Tudor and Cromwell. Transactions of the Royal Historical Society (Royal Historical Society). 1886, 3: 343–70. doi:10.2307/3677851. Paul, Henry Neill. The Royal Play of Macbeth: When, Why, and How It Was Written by Shakespeare. Macmillan Publishers. 1950. Perkins, William. A Discourse of the Damned Art of Witchcraft, So Farre forth as it is revealed in the Scriptures, and manifest by true experience. Cambridge University Press. 1618 [24 June 2009]. Rosenthal, Daniel. 100 Shakespeare Films. British Film Institute. 2007. ISBN 978-1-84457-170-3. Sanders, Julie. Shakespeare and Music: Afterlives and Borrowings. Polity Press. 2007. ISBN 978-07456-3297-1. Shaughnessy, Robert (ed.). The Cambridge Companion to Shakespeare and Popular Culture. Cambridge University Press. 2007. ISBN 978-0-521-60580-9. Shirley, Francis. Shakespeare's Use of Off-stage Sounds. University of Nebraska Press. 1963. Spurgeon, Caroline. Shakespeare's Imagery and What It Tells Us. (编) Wain, John. Shakespeare: Macbeth: A Casebook. Casebook Series, AC16. Macmillan. 1969: 168–177. ISBN 0-876-95051-9. Straczynski, J. Michael. Babylon 5 – The Scripts of J. Michael Straczynski, Vol. 6. Synthetic World. 2006. Tanitch, Robert. London Stage in the 20th Century. Haus Publishing. 2007. ISBN 978-1-904950-74-5. Tanitch, Robert. Olivier. Abbeville Press Publishing. 1985. Tritsch, Dina. The Curse of 'Macbeth'. Is there an evil spell on this ill-starred play?. Showbill (Playbill). April 1984 [28 November 2010]. （原始内容存档于2011年7月15日）. Walter, Harriet. Actors on Shakespeare: Macbeth. Faber and Faber. 2002. ISBN 978-0571214075. Wells, Stanley and de Grazia, Margreta (eds.). The Cambridge Companion to Shakespeare. Cambridge University Press. 2001. ISBN 0 521 65881 0. Wells, Stanley and Orlin, Lena Cowen (eds.). Shakespeare: An Oxford Guide. Oxford University Press. 2003. ISBN 0-19-924522-3. Wells, Stanley and Stanton, Sarah (eds.). The Cambridge Companion to Shakespeare on Stage. Cambridge University Press. 2002. ISBN 0 521 79711 X. Wells, Stanley and Taylor, Gary (et al.)(eds.). The Oxford Shakespeare: The Complete Works (Second Edition). Oxford University Press. 2005. ISBN 978-0-19-926718-7. Zagorin, Perez. The Historical Significance of Lying and Dissimulation—Truth-Telling, Lying, and Self-Deception. Social Research (The New School for Social Research). 1996, 63 (3): 863–912. Raphael Holinshed's Chronicles of England, Scotland, and Ireland, based on Hector Boece's 1527 Scotorum Historiae. Compare also the Witch of Endor. The Tragedie of Macbeth - HTML version of this title.